Hi Everyone how are you ? you might have notice the new look of best2know.info so today i thought i will give your blogs the new look. How can I ? 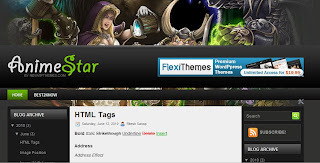 you all might know that i convert wordpress templates to blogger so today i introduce this new template designed by newwpthemes and converted by Me (Ritesh Sanap) . This is an very good template for the people who write about gaming or about Anime . So its the Name the name of the Template AnimeStar. IF you have your own request to convert any template of any platform you can request it from clicking here.Your template will be converted with free of cost.